Don't just take our word for it – here's what students say about what it's like to study at Kingston University. Dora Namyalo has recently been featured in Future Leaders, an annual publication celebrating the UK's 100 most talented black students after she was nominated by her lecturer, Dr James Barker. "I chose to do the Analytical Chemistry MSc because I did a bioanalysis module during my undergraduate degree which made me develop an interest in analytical chemistry. 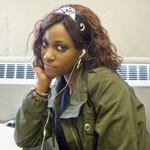 "The teaching is great; the lecturers are the best, very approachable and helpful. The lecture material is absolutely relevant and the lectures basically take place on Wednesday and Thursday only, allowing us loads of time to study and get coursework done on time. The practicals on the course are really helpful. I got to use loads of the analytical instruments such as GC-MS, Infrared, UV-Vis and so many more. "I spent three months at GSK on a work placement, working as a development scientist for the New Product Development Aquafresh team. During my placement I carried out a method development and validation of a calorimetric technique to study the reaction between hydroxyapatite (HAP) and sodium fluoride. The method development involved determination of the amount of HAP to be used and the most effective conditions at which to run the experiments, while validation involved determination of the linearity, precision, robustness, accuracy and repeatability of the method. I also regularly assisted in the dispensing of raw materials and manufacture of toothpastes in the laboratory which allowed me to apply good laboratory practice and work in an accredited laboratory environment. "Overall the placement allowed me to gain invaluable experience for a global organization that I can put on my CV as work experience which automatically makes me more employable – the industrial placement at GSK, simply unbelievable. "My long term ambition is to start my own independent analytical laboratory and I got to figure that out while in Kingston. Kingston is just a really chilled out place so there's no pressure to act a certain way or be a certain way. I was myself throughout and it's been so much fun."